Goodreads Synopsis:“Princess Snow is missing. I absolutely adore fairytale retellings and have read my fair share of them. There seems to be some unspoken need amongst authors to rewrite Snow White for some reason, and while I don’t quite understand it, I’m glad that R. C. Lewis has chosen to retell Snow White. But with drones. 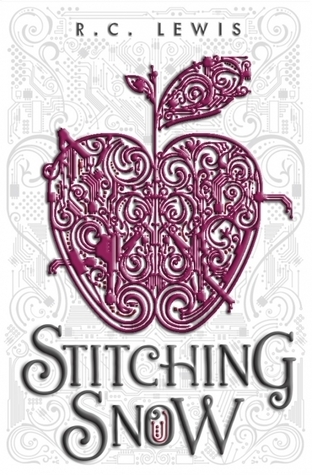 Stitching Snow reminds me of Marissa Meyer’s series (haven’t read them, I’m just making a synopsis comparison), but regardless of whether they’re too similar or not, I really, really, REALLY enjoyed this book. A lot. Can you tell? Essie lives on a desolate planet called Thanda where she spends her days ‘stitching’ together coding to repair the seven drones she lives with. These drones work the mines of Thanda to lower accident cases for the other workers. Aside from coding, Essie makes her money by participating in cage fights with the local residents. She’s a total badass I tell you. On her way home from a fight one night, Essie witnesses the crash of an unregistered spacecraft with a single man on board. In an attempt to get rid of the guy and the spacecraft before the border authorities come, Essie agrees to fix his spacecraft for him. What she didn’t predict was that Dane’s appearance in Thanda was far from accidental. He was on a mission to find the missing Princess Snow whom had disappeared without a trace years ago. While this book is quite predictable (as most retellings usually are), Lewis’s spin on the tale had me flipping through the pages on my kindle like mad. I couldn’t stop reading and Essie’s story had me hooked. I fell in love with her drones, especially Dimwit who’s a little dim (har har), frustrated Essie a lot, but what a wonderful addition to the story. Unfortunately we don’t really get to see much of the other drones before Essie is whisked away from Thanda by Dane, which was very disappointing. I really enjoyed the parts where the drones are interacting with each other, they’re just so endearing. We visit a few different planets during Essie’s adventure and they’re all a little different in some ways. I’m glad that the worldbuilding for the novel is solid in the sense that Lewis actually attempted to create a whole world with different planets that all had their own political systems. Although Essie did not spend all that much time in each of the different planets, Lewis managed to give each place a sense of aliveness. Is that a word? They felt real is what I’m trying to say. Their systems are not so complicated that the reader is unable to follow it – it’s definitely sci-fi for a younger audience. If you’re new to sci-fi or hesitate in reading this genre, I recommend you start with Stitching Snow. The sci-fi does not overwhelm you at all. I enjoyed reading about Dane and his motivations for finding Princess Snow. I knew he was shady the minute he landed on Thanda, but it was nice to find out why he did the things he did. He’s not a bad person and he definitely grows on the reader and Essie as the story progresses. The both of them are soon drawn into a plot to take down the corrupted King and Queen whose rule has brought devastation to many. I enjoyed the slow development of the romance, which made it a lot more believable for me. I loved their banter and the slow progression from enemies to allies the closer they both got to the evil King and Queen. Overall, Stitching Snow was a very enjoyable fairytale retelling that more people need to read! It was a surprising gem of 2014, and I was definitely surprised with how much I enjoyed it. I think a lot of it is because of the drones, especially little Dimwit who you can’t help but love. Highly recommended for lovers and beginners to sci-fi, and anyone that likes a retelling. Thank you to Disney-Hyperion on netgalley for providing an eARC in exchange for an honest review.